Looking for a home is very time consuming and finding the right loan can be paramount to buying your home and closing on time. .
Finding the best va loan rates can be easy when you know your credit score, how it will affect your rates and ways to increase your credit score for lower rates. Today I will go over the minimum credit score for a va loan, the different va loan rates by credit score, as well as a few tips on how to increase your score and get approved for va home loans. The VA Loan is part of what is known as the GI Bill of Rights and provides veterans with the ability to purchase a home without any down payment required. 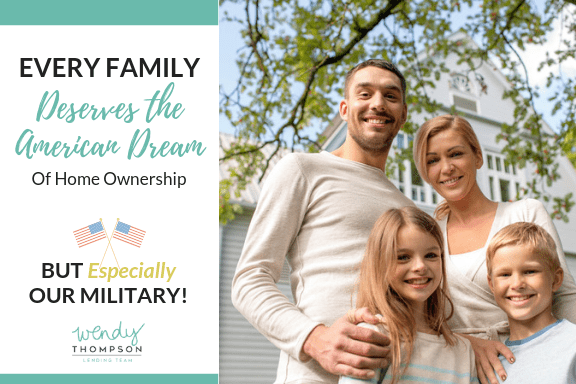 It was created so that veterans and their families could easily obtain home ownership. For A VA Loan In order to qualify for a VA loan you must have served on active duty and have been discharged after 90 days of service during wartime or 181 continuous days during peacetime. You can’t have been dishonorably discharged and there is also a 2 year waiting period if you began service after September 7th 1980. There is a 6 year requirement if you are part of the National Guards or Reserves and there are also specific rules in regards to the eligibility of surviving spouses. In order to obtain this loan, along with meeting the service requirements, you must also meet the credit and income requirements required by the lender to be eligible. Loans guaranteed by the VA are still made through private lenders like Mortgage companies so that veterans may purchase a home. However, the veteran must live in the home in which they wish to purchase. With a traditional loan, you will be responsible for a down payment to secure your loan. This down payment usually serves as proof that you are taking financial responsibility for your home and that you have some sort of financial means to do so. Since a VA loan doesn’t require a down payment, the VA guarantees the lender that if you were to default on your loan, the VA will cover that down payment protection they didn’t initially receive. The minimum credit score for a VA loan is going to be around a 580. There is more than one reason you could have a 580 credit score. You could just not have any credit established which gives you a lower score. In this case you would need to have at the least 3 trade lines on your credit before most lenders will approve you for a loan. Learn more about how to use credit tools to build and improve your credit. You could just have poor credit overall with a solid amount of late payments or charge-offs. If this is true, I would work on going 1 year of no missed payments as well as paying anything that has been charged off before applying for a loan. The debt to income ratio allowed for a VA loan is 41%, and is used to determine if you can even qualify for a VA loan. This ratio is calculated by determining the percentage of your gross monthly income that goes toward your monthly debt. The lower this ratio is the better your chances are for getting approved for a loan. If you have a monthly income of $5,000 and a monthly debt of $3,000 then your debt to income ratio is 60% and this would disqualify you for a VA loan. This shows that your money is stretched thin and makes the lender think you might not be able to pay off the loan. On average, a lender wants to see that you have 2 years of stable work history with an employer. This doesn't mean you can't get approved for a loan if you don't have 2 years of employment, but it will be harder. Getting a handle on the above three things is essential for you to be able to get approved for a VA loan. If you aren't sure where to start, we can help, just click the button below to get started. Usually rates only change with a 20+ point change in your credit score. For example, a score from 600-620 will qualify for the same rate, but a score from 621 to 640 will put you at a lower rate. With a credit score between 600 to 620 you will probably have the second highest interest rate for your va backed loan. Credit scores like a 605, 610 or 615 are well below the national average score of 699. Since your interest rate is higher, your loan will be higher on a month to month basis and this can affect your debt to income ratio when it is being used to calculate your eligibility. According to loan officer William Caballero, "The VA limits the amount of discount points one can buy on a VA loan. Most of the time the investment isn't worth the savings." Since this is the case, you probably would want to invest in getting your credit score higher and not worry about paying down any type of points on the loan. Your income and employment are going to be important factors because a low credit score is seen as a negative in the eye of any lender. If your score is low because you have no credit you will still be looking at the same interest rates. No Credit is still treated like Bad Credit in some ways so be sure to have or add at least 3 trade lines to your credit as soon as possible. With our process we should be able to guide you into the Va Loan that best fits the needs of you and your family. Below will be loan rates based on credit score and we will keep these standard through this post. We want to give you an Idea of how much you could be saving if you just increased your score by one group. If you were to take your score from the low 600's to a 620, you would be saving an extra $31,348 in payments. When you reach credit scores like 623, 630, and even 635, you are eligible for a lower set of loan rates. You still don't have that 699 credit score which is the national average, but you will have a bit more wiggle room in the area of your debt to income ratio. With a credit score around a 625 your employment history will be important. You might have some things on your credit that will need to be paid to zero before you can qualify for your loan such as charge offs. Most lenders don't want to see that you have unpaid collections on your credit report and will require you to pay them down before the loan can be approved. Unfortunately, paying off collections won't immediately help your score so I suggest that if you are going to pay off a collection that you request a PFD (Pay For Deletion). Several collection agencies will actually delete your collection if you pay it off. This is great because it would look as if the collection never existed and can help your credit much more than a paid off collection sitting on your report for seven years can. You also need to be very mindful not to miss any payments that could affect your credit score. When it comes to rates and credit scores it is always good to show what the rates could be based on your current score and what it could be if you increased your score. If you were to take your score from the low 639 to a 640 or 650, you would be saving an extra $24,094 in payments. I remember when everyone wanted to have a solid 650 credit score, it wasn't a 700 but very close to it. Unfortunately in 2018 the average credit score is a 699 so you would still fall short and still won't be getting the best interest rates with a 650 credit score. Getting a VA loan with a 640 score isn't impossible, but some work will be required. In this range you might have a few credit issues lingering that probably won't prevent you from owning a home. Usually you would want to have 2 years behind you for any type of bankruptcies, past foreclosures or repossessions. Hitting a new level of credit score also opens your loan opportunities up to more lenders. This means that more lenders are competing for your business which gives you the best opportunity for much lower rates. Again, the more you increase your score, the more you will have in savings. If you were to take your score from the 659's to a 660, you would be saving an extra $11,798 in payments. Once you are in the 680 range you won't see your rates go lower unless you are above a 720 credit score. This is the sweet spot because you are either, right below, at, or above the national average in regards to your credit score. When it comes down to VA Loans, a 690, 700, or 710 credit score is going to give you one of the lowest interest rates available and will also make the rest of the process run smoother. Since you will have the lowest interest rate, your monthly payments will be much lower and it will be easier to qualify for a loan based on your debt to income ratio. Your income and employment are still going to be a solid factor in determining if you will be approved for coverage or not. 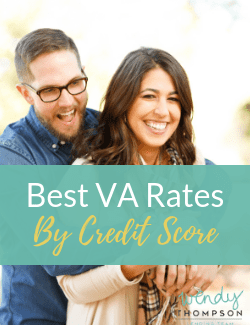 Outside of your employment and how much loan you can afford, having the highest credit score possible is going to be your best way to qualify for a va loan. If you were to take your score from the 720's to the 760's, you would be saving an extra $11,963 in payments. Below is a list of ways to increase your credit score, especially if you are only a few points away from breaking into a new rate bracket. This might sound counter productive, but hear me out, when you apply for a credit increase, that doesn't require a hard pull on your credit, it lowers your credit to debt ratio, which is a factor in calculating your credit score. The credit to debt ratio is a number that creditors use to determine how much of your credit you are currently using. If you are using too much credit, your score will start to go lower; however, if you get a credit limit increase, this would decrease that amount and help your score improve. The main factor with choosing this route is to NOT use the new credit. When a lender sees that you are applying for a large amount of credit they get concerned. Having too many inquiries will also negatively affect your credit score. If anything requires you to do a hard pull your credit, don't do it. If you already have established credit, then applying for a new credit card is only going to hurt you because it gives you a new inquiry and decreases your average age of accounts. You will have to wait up to 2 years for the inquiry to fully fall off of your credit and even longer to recover from your average age of accounts. Credit should be looked at daily to combat any type of fraud; however you should only think of your credit in 30 day intervals. The longer you go with paying your bills on time, the better your credit profile will be. Remember, paying your bills on time is a huge factor in determining your credit score. Having a different mixture of credit will also help you in obtaining a higher credit score. Loans, credit cards, lines of credit, home loans and auto loans are all seen as different types of credit and having a good mixture will aid in helping your score. If you are going to have a few hard hits on your credit, make them worth it. Hopefully these few tips will help you with increasing your score in the immediate future. The worst thing you can do when applying for a VA loan is to go with a Lender who isn't specialized in VA Loans. It's also not a great Idea to go with some of the larger VA Lenders that don't always close on time. 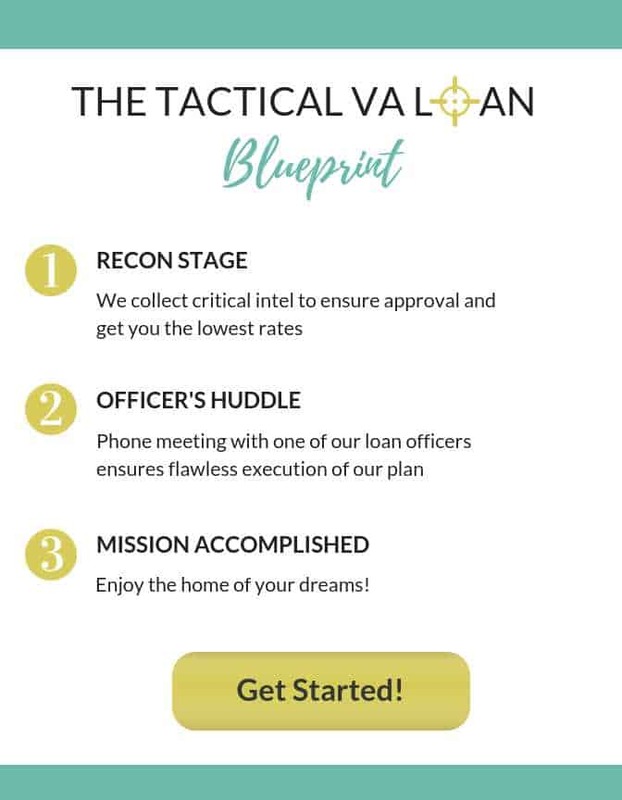 We have a solid 3 step plan called the Tactical Va Loan Blueprint that we take each of our customers through. In this initial stage we will collect all of your information to find out what you qualify for, uncover any skeletons that may be lurking in your closet and get your loan process started on the right path. You complete a 15 minute phone call with one of our loan officers to go over a strategy and answer any questions you may have. Finally we execute the plan to purchase your home. To get started on your Tactical Va Loan Blueprint, click here. Overall there isn't any reason to wait when it comes to getting a solid VA loan to make sure you are able to close on time. Unlike some of the larger VA lenders out there that constantly miss closing dates, we pride ourselves on our Semper Satisfied Guarantee. We guarantee that you will be Semper Satisfied and we are 100% committed to your satisfaction so long as you follow all of the Tactical VA Loan Blueprint steps. Click on the button to your right or above to find the VA loan that best fits your needs.